As new processes and technologies emerge, HIM leaders may want to consider if it’s time to reshape departmental structure. Reengineering gained momentum in the early ’90s with the release of Michael Hammer and James Champy’s book, Reengineering the Corporation: A Manifesto for Business Revolution. 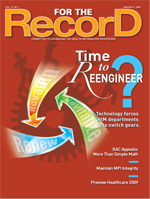 Basic definitions of reengineering include “using information technology to improve performance and cut costs” and “systematic starting over and reinventing the way a firm, or a business process, gets its work done.” In today’s ever-changing healthcare environment, where technology enables facilities to continue to improve performance and examine the way processes are carried out, reengineering still has its place. Kelly McLendon, RHIA, president of Health Information Xperts, LLC, says that in the recent past, most reengineering that has occurred in HIM departments revolved around large-scale projects done in conjunction with the installation of electronic document management systems. He believes the biggest reason why facilities look at reengineering is to find opportunities to make changes and do things a new way. McLendon says the reengineering movement in HIM has seen its resurgence as technology enhancements have become enterprise oriented. “Most facilities reengineer when changing to an electronic document management system because with that, everything gets touched, from coding to transcription to efficiency analysis and so on. With automation, processes are changed from front to back throughout the department,” he says. He adds that vendors selling document management systems are essentially selling change. But while hospitals want change and they think they are ready for it, changing is often more complicated than they expect. Similarly, Karen G. Youmans, MPA, RHIA, CCS, president of YES HIM Consulting, Inc, finds the changing role of the HIM director and the implementation of the electronic medical record (EMR) as the two main reasons why HIM departments find themselves in a situation that calls for reengineering. But with the way HIM is transforming, McLendon sees many projects involving the implementation of document management systems, with most top-to-bottom reengineering projects in recent years centering around issues that present because of automation. “Sometimes a department might have a small mess because of how technology is evolving. For example, speech recognition is an evolving technology that makes facilities look at their dictation and transcription processes. It involves a bit of reengineering, and we see automation happening in other areas similar to speech recognition. So a facility may change what they do a little, but not completely reengineer,” McLendon says. An EMR implementation can pose a similar situation. With the EMR, McLendon often sees situations involving clinicians who don’t completely understand HIM and assume they can start a process such as portable documentation, believing it can be done differently and imposing their ideas on HIM, which isn’t reengineering. Adopting document management systems is the reason for a large portion of the reengineering processes that Youmans encounters. “Some facilities have been status quo for 30 years, then a new person is hired and wants to make big changes. I tell them that they have to realize that they can’t undo 30 years of stagnation in one year,” says Youmans, who adds that first the institutional culture must change and there must be buy-in from upper executives and physicians. She also warns that reengineering, especially when dealing with changing from paper to electronic records, will bring everything to the forefront that perhaps the staff have known was done wrong or inefficiently for years. “Processes that don’t work get highlighted when you go through reengineering. I always tell my clients that it’s going to get ugly before it gets better, but once you get over those humps, you can find success and see the difference it makes,” says Youmans. With any reengineering project, it is important to have support from upper management. McLendon finds that they sometimes are the ones asking for the problem to be fixed. Other times, department heads bring in a consultant to show upper management that there needs to be a change. When undertaking a reengineering process, McLendon recommends following a careful process. First, he suggests obtaining an unbiased department assessment. “It’s important that the assessment be unbiased. We are what I call ‘vendor agnostic’ and call it like we see it,” he says. He then recommends designing a plan for remediation, which must be adopted by the larger group and gain buy-in from all parties. Next, the execution plan provides the right timeline and stresses a commitment to making whatever change is necessary for success. “Sometimes, the changes could include changing processes, changing vendors, or even changing the whole way they do business,” says McLendon. After a project is complete, it is important to receive a summary report and measure the outcomes. McLendon also says it’s a good idea to measure outcomes again six months to two years after project completion. “Measuring outcomes in the near term and long term is the right thing to do, but not always something that occurs,” he notes. Youmans agrees that once buy-in from upper management is established, it is important to perform a proper department assessment. The process must analyze every area, including coding, transcription, the department’s layout, the number of employees, the type of management, and so forth. From there, Youmans often provides a top-10 list of the elements that need to be corrected for the project to be a success. “I stress that change won’t happen overnight. Some HIM directors get discouraged, but I challenge them to set goals, focus on the top two problems, achieve those, then move forward from there and tackle the next two, then the next two,” she says. Implementing best practices is an important aspect of reengineering. To institute such policies, facilities often rely on the vendor and the implementation guidelines that come with their products. The AHIMA is producing more usable material regarding best practices, but it is sometimes hard to find, which, according to McLendon, is why using a consultant can be helpful. “Anyone can reengineer if they know what they are driving toward,” says McLendon, who also notes that the AHIMA is widening its scope to include more information about managing electronic records, which is important because it helps consultants create a vision for HIM’s role. Nevertheless, reengineering projects can sometimes meet resistance from staff. “You have to watch the players and signals to see if they are going to adopt the changes,” McClendon says. “You really need buy-in from everyone involved, as well as enforcement of the new policies and processes.” He finds that projects involving reengineering for the automation of document management run more smoothly than others because upper management usually has embraced the idea from the onset. With the nationwide EMR movement gaining steam in recent years, Youmans has seen a change in the HIM environment. “If facilities are not totally into it, they are [at least] doing some kind of document management, and that takes a lot of time to reorganize and retrain staff,” she says. Youmans notes that in addition to their everyday workload, today’s HIM directors have 25% to 50% additional time added to their schedules just for the issues related to implementing a document imaging management system—a situation that can wreak havoc on a department. She also has found that HIM directors are more in demand to attend meetings across the health spectrum, whether it’s for finance, accounts receivable, The Joint Commission, HIPAA, or other areas. In fact, they may end up spending nearly 40 hours per week just in meetings. “So when it comes time to converse with staff, develop new plans, or even catch up on their e-mails, they run out of hours in the day, which creates the issues we face today in how to transform the HIM department,” says Youmans. In contrast to the ’80s, when most directors had assistants and various layers of management overseeing the day-to-day operations, many middle layers of management today are now eliminated, so the director has to be involved with the “nitty gritty” of daily operations, according to Youmans. “They are trying to institute change, so many times they look toward using an HIM consultant because they [HIM directors] have great ideas but just don’t have the time to implement them,” she adds. Some processes are easy to correct, but the staff often don’t have the analytical skills or time to figure out the problem. “Often, you’ll find something that is an easy fix, but until someone takes the time to take a step-by-step look at the process to figure out where it broke down, it can’t be fixed,” says Youmans. For example, a CEO received a letter notifying him that the facility was only at a 63% compliance rate for submitting birth certificates for registration in a timely manner. In looking at the process, everything appeared to be in order: The staff responsible were performing the task efficiently and kept logs that showed the work was getting done as expected. However, it was uncovered that they were using the facility’s courier, who was also in charge of delivering such items as lab samples. Upon further investigation, it was found that when the courier ran out of time on a busy day, the birth certificate registrations were the items left for “next time.” As a result, a new process to express mail birth certificates in batches several times per week was instituted, and the low compliance rate was no longer an issue. At another facility, where the document imaging system uses work queues to organize coding jobs in a “first in, first out” fashion, it was found that one queue had a backlog of more than 20,000 records, an astronomical total that left the HIM director baffled. By examining the process and breaking it down, it was discovered that changes in some employees’ job functions and the departure of another person created a situation in which no one was assigned to that particular work queue. Because everyone was busy with their own work, no one realized what had happened. To solve the problem, six employees were cross-trained and assigned to tackle the previously unattended queue for one to two hours per day. Weekly goals were set, and a graph was created to illustrate the employees’ progress as the queue decreased. It took six weeks, but eventually the backlog was eliminated. For an HIM department considering reengineering, Youmans suggests having an outside assessment done by an experienced consultant to obtain an overview of where you are and where you want to be. Then, request a report containing the top-10 components that need to be reworked, realizing that some will be short-term projects while others will take longer to accomplish.